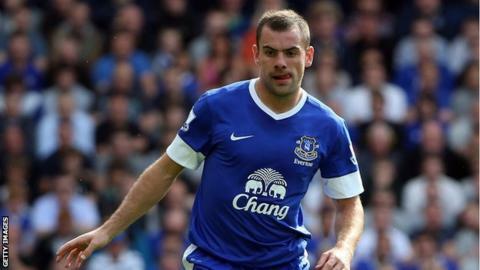 Everton midfielder Darron Gibson will be out for another two to three weeks with a thigh strain, manager David Moyes has confirmed. The 24-year-old sustained the injury in the Toffees' most recent Premier League game, a 2-0 defeat at West Brom on 1 September. Moyes said: "It is a concern for me because he has been very consistent and very good." "It is a blow but we will have to find ways of getting around it," he added. Gibson recently ruled himself out of selection for the Republic of Ireland's World Cup qualifier with Kazakhstan. The player told boss Giovanni Trapattoni he was disappointed with his limited role during Euro 2012. Moyes reported no other problems from players coming back from the international break ahead of Monday's visit of Newcastle.